Following a quick investigation using the DPC Latency Checker it looks like the culprit (or one of the them) is the ASUS WL-159G (Zydas ZD1211 chip) wireless driver. It was obvious when transfering large file over wireless, the more speed the more DPC CPU usage, going as high as 80%. When idle / no transfers, the DPC latency checker showed yellow graph lines at around 1000 µs, with the ocasional 1-3% CPU usage. 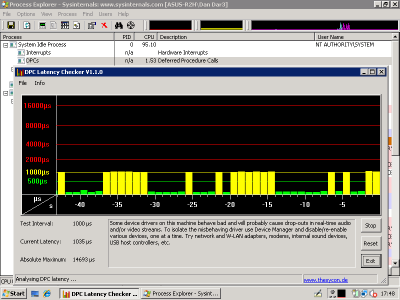 Disabled the ASUS USB Wireless Network Adapter and you're in the green with a few yellow spikes. I also found that the Airlink AWLL3026 drivers work fine with ASUS WL-159G device. Airlink has a newer driver for Vista - 04/20/2007, 2.0.2.2 - although this one doesn't change anything compared to previous driver I was using (version 2.0.0.130), it's good to know since ASUS doesn't seem to be updating drivers for this model anymore. Does the Airlink driver work better than the ASUS one for the ASUS WL-159G wireless device ? To be honest I haven't compared the peformance, but if you were having problems I would recommend trying it. It would be as easy as extracting the archive in a temp folder and using the Device Manager to manually update the driver.